URBED helped facilitate a workshop drawing together the Academy of Urbanism and the Oxford Civic Society to look at zone around the station known as Oxford Central West. This area is crucial to the future of the city and is perhaps the most extraordinary underdeveloped area of any historic city in the UK. 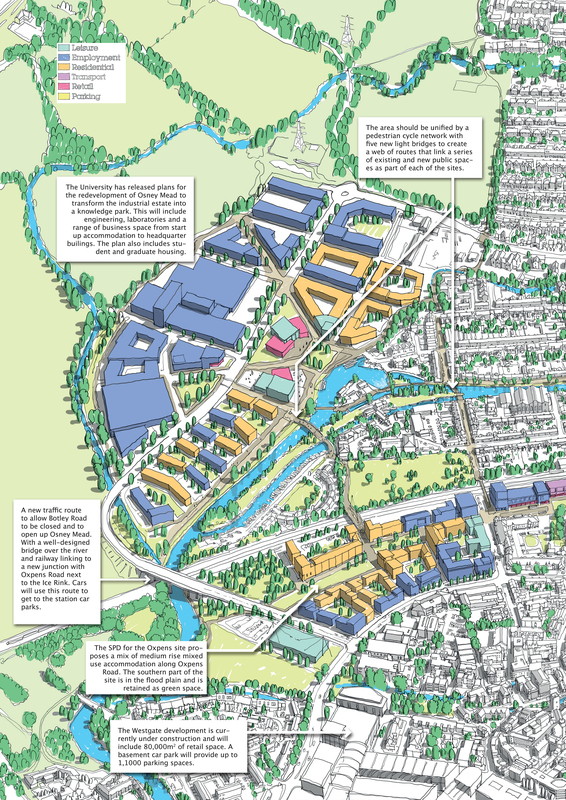 Further more with plans for the redevelopment of the station being promoted and masterplans being announced for Oxpens and Osney Mead, there is a once in a lifetime opportunity to transform the area into a new quarter for the city, fit for the 21st century. We should be aiming to substantially reduce the amount of traffic coming into the city from the west and certainly remove all through traffic. This will allow the improvements to Frideswide Square to be extended and allow the car park on the former canal basin site to be redeveloped. Bus stops should be provided on street, avoiding the need for a bus or indeed a coach station. A bus circuit would be created allowing for pick up and drop off on street with driver layovers happening elsewhere. To achieve this we suggest creating a traffic route through Osney Mead with a well-designed bridge over the river and railway linking to a new junction with Oxpens Road next to the Ice Rink. This will unlock the development of Osney Mead and allow access to the new Westmead shopping centre while relieving pressure on the station area. The area should be unified by a pedestrian cycle network. We suggest that this will require the five new lightweight bridges to create a web of routes that link a series of existing and new public spaces. Commercial and residential development on the Osney Mead and Oxpens sites should be undertaken incrementally. A comprehensive approach that requires sites to be cleared before work starts will mean that nothing ever happens. The station should similarly be developed in stages allowing the platform work to be undertaken first, with each element linked to commercial development as part of a clear masterplan that is integrated into the rest of the area. This all requires a mechanism to coordinate development across the area and to use part of the value generated to fund the necessary infrastructure. Overall the conclusion was that there is a way of making the whole area into somewhere that is coherent and connected and which makes the most of its unique sense of place. There is also a way of procuring a new station at a realistic budget, dealing with congestion on the Botley Road and even sorting out the bridge without spending millions. All that is needed is an area-wide perspective. As part of the Oxford Central West event, a news sheet has been published that brings together commentary text with further images and information.